I’ve been a Linux Mint OS user for several years now. I stuck with version 17.3 for a long time, but I screwed things up on numerous occasions by copy-pasting command line instructions from random sources on the net. Eventually I started encountering issues because I had changed file locations and destinations too many times, and decided a fresh install would be nice. 1) Back everything up from the OS you are about to obliterate. I used an external hard drive. 2) Check again if everything is backed up somewhere, because it will soon be wiped from the computer’s disk forever. 3) Download the newest version of Mint. Find and use the software to create a bootable pen drive. I used Mint 17.3’s default ‘USB Image Writer’. 4) Restart the computer with the pen drive inserted into a USB port. You may need to enter BIOS setup to be able to boot from the pen drive. You may encounter UEFI vs. Legacy boot options, in which case ask a search engine about what to do. 5) Once the boot drive is running, follow the instructions and install your new OS. Very simple. 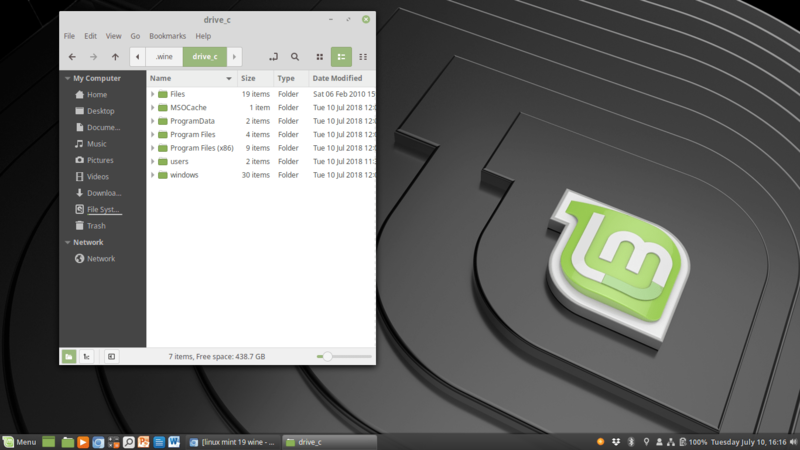 6) Search online for ‘Things to do after Linux Mint 19 install’ – there are plenty of articles out there to guide you through the update process, a few tweaks, and recommended software. 7) Copy your files from their temporary storage space to the new home folder. The exception is getting any must-have Windows software on the Linux OS. I often encounter compatibility issues when someone sends me a MS Word file or MS powerpoint file, because I tend to use Libre Office. LO is a great office suite, and it really shouldn’t be necessary to use MS Office unless you run into compatibility issues, like I did. To get the Windows software to run on Linux, you have a few options. Two of these options are to use WINE or a virtual machine. I have never used a virtual machine, but I have used WINE (which is software that will create a ‘compatibility layer’ for running Windows software) via Linux software called PlayOnLinux. PlayOnLinux did not work after several installations and removals, so I reverted straight to WINE. 4) With WINE now installed, find the WINE folder. Mine was in the home folder, but it was hidden. You use ctrl+H to show hidden files. Enter the WINE folder, and then the drive_c folder. 5) Add a folder into which you will copy-paste the executable windows file. Now I must say I used a .iso file for a MS Office installation, and copy-pasted it into the ‘Files’ folder I created on WINE’s drive_c folder. I ran the .iso by right clicking it and opening with archive manager. It opened all the files in a new window, and I clicked extract. It extracted into the same ‘Files’ folder in which I was working. You may be using a .exe file, but I imagine the same procedure applies. 6) Once extracted, I found the ‘install.exe’ file and ran the process as I would have done in a Windows OS. The procedure was self-explanatory for the rest of the office install. I had to accept the installation of some other wine-related software a couple of times, but it all ran itself really. 7) Once everything seemed done, I closed the several windows that had been opened, went to the menu bar, typed ‘word’ or ‘office’ and the programmes were there. I right-clicked and added icons to my bottom panel. You may wish to add desktop items instead.